We have been students of organizational performance—both corporate and nonprofit—for a combined sixty years. Most of the rich and varied case examples we present are of organizations and individuals we personally know from our advising, evaluating, teaching, and studying. We hope that their examples will enrich your lives and work as they have ours. We have also benefited greatly from a long line of distinguished observers of organizational performance whose thinking has informed our own. We emphasize this because there is no settled view on how to assess an organization’s performance; neither is there any general agreement on how to identify those attributes that correlate with, much less cause, that performance. Back when Bill Meehan joined the San Francisco office of McKinsey & Company in 1978, he met Tom Peters and Bob Waterman, who had just initiated their research for In Search of Excellence: Lessons from America’s Best-Run Companies, an early business blockbuster that helped carve out a category of popular books on organizational performance.2 In an era when strategy, analysis, and quantification were ascendant, Peters and Waterman, among many other things, reinforced that there was no formulaic approach to creating and sustaining a great organization. And oh, by the way, people and culture were essential elements too! Three other studies of organizational performance have particularly swayed our thought and practice. In the early to mid-1990s, Mike Murray and Gil Marmol of McKinsey studied high-performing organizations.5 Their summary of six attributes of high-performing organizations, while based mostly on their own insight, interpretation, and wisdom, is (in our estimation) on the same plane with what Drucker, Peters and Waterman, and Collins have described on the basis of their research. In 2001, Richard Foster, together with Sarah Kaplan, wrote Creative Destruction: Why Companies That Are Built to Last Underperform the Market—And How to Successfully Transform Them.6 Foster and Kaplan’s book set a standard for the statistical analysis of corporate performance by analyzing more than sixty variables to create a database of more than a thousand US companies in fifteen industries over almost four decades. Their key finding should guide everyone’s thinking about organizational performance: over time, all undiversified corporate performance regresses to the industry mean. That is, of course, what competition and markets do. While we have a great appreciation for the quantitative power of Foster and Kaplan’s work, we took a different page from Jeffrey Pfeffer and Robert Sutton, who relied on their personal experience—including interviews, informal conversations, quick observations, long-term ethnographic studies, and consulting engagements—to dispel management myths in Hard Facts, Dangerous Half-Truths, and Total Nonsense: Profiting from Evidence-Based Management.7 Our inferential conclusion: be afraid, be very afraid, of how data is misused but be grateful, very grateful, that evidence-supported management practices do exist. In our research, we have chosen to rely on our own insight and thinking instead of depending on the “wisdom of crowds” and have made no attempt to measure longitudinal statistical performance. Impact measurement of nonprofits, despite some progress, is nowhere close to identifying the key dependent variable that might be comparable to shareholder value for corporate organizations, so such an approach would have no merit. Our goal is to codify principles, offer frameworks, and spotlight nonprofits that we assess to be high performing—better than other organizations in their field—so that we may all learn from them. We are, in our roles in the nonprofit sector, empirical in mind-set, analytical in approach, and deeply moved by our heart-and-soul personal experiences in the social sector. In Bill’s case, this goes back to a serendipitous 1974 encounter that shaped most of the facts of his life from there on out. It was his last semester at Columbia University and he bumped into a classmate who introduced him to Bill Drayton, who was then working in an early version of McKinsey’s Social Sector Practice. This led to Bill Meehan’s first postcollege job and helped set the course of his professional life. Bill Drayton and his founding role in the social entrepreneurship movement set the standard for pursuing social impact and continue to define it. Bill has taught a course on strategic leadership of nonprofit organizations at the Stanford Graduate School of Business (Stanford GSB), for eighteen years and counting, and during this time has frequently joined forces with Kim. Together, they have advised many nonprofits, written articles on the sector for Stanford Social Innovation Review (SSIR), and worked to develop the evaluation criteria for the Henry R. Kravis Prize in Nonprofit Leadership. Kim, for her part, oversaw the Kravis Prize from 2005 to 2015. During that time, she had the privilege of learning and thinking about the topic of nonprofit leadership with a committee composed of knowledgeable, wise, and intellectually rigorous individuals. Marie-Josée Kravis, a respected economist specializing in public policy analysis, served as chair of the selection committee, which included Henry Kravis, cofounder of Kohlberg Kravis Roberts & Co.; James Wolfensohn, former president of the World Bank; Amartya Sen, Nobel Laureate in Economics; Josette Sheeran, president and CEO of the Asia Society and former executive director of the World Food Programme; Surin Pitsuwan, former secretary-general of ASEAN; Lord Jacob Rothschild, founder of J. Rothschild Assurance Group (now St. James Place); Ratan Tata, chairman emeritus of Tata Group; and Harry McMahon, board chair emeritus of Claremont McKenna College. The notion of drawing out fundamentals in the field and steering organizations away from the siren songs of fads came into clear view in 2013, when Kim suggested that she and Bill lead a day of peer learning with all of the Kravis Prize winners. On this occasion, both were struck by how these top-performing, diverse nonprofits described what drove their high impact and growth and also by what presented them the greatest challenges. The factors they discussed were strikingly similar and are all captured in the pages that follow. Most recently, our work as funders with King Philanthropies with a focus on extreme poverty alleviation has deepened our insight into the sector and reaffirmed our takeaways. Last, we have expanded and tested our personal knowledge by launching the 2016 Stanford Survey on Leadership and Management in the Nonprofit Sector.10 Collaborating with GuideStar, BoardSource, the Stanford Center on Philanthropy and Civil Society, SSIR, and Stanford GSB’s Center for Social Innovation, we received more than three thousand responses from nonprofit executives and staff, nonprofit board members, donors, foundation executives and staff, foundation board members, and other stakeholders. This broader set of data has added depth and richness to our Drucker-inspired approach. We do so hope that you, our readers, can learn from our thinking and writing. We expect and invite all of you to challenge, or even disagree, with our findings and conclusions. And we hope you will interact with our website, engineofimpact.org. 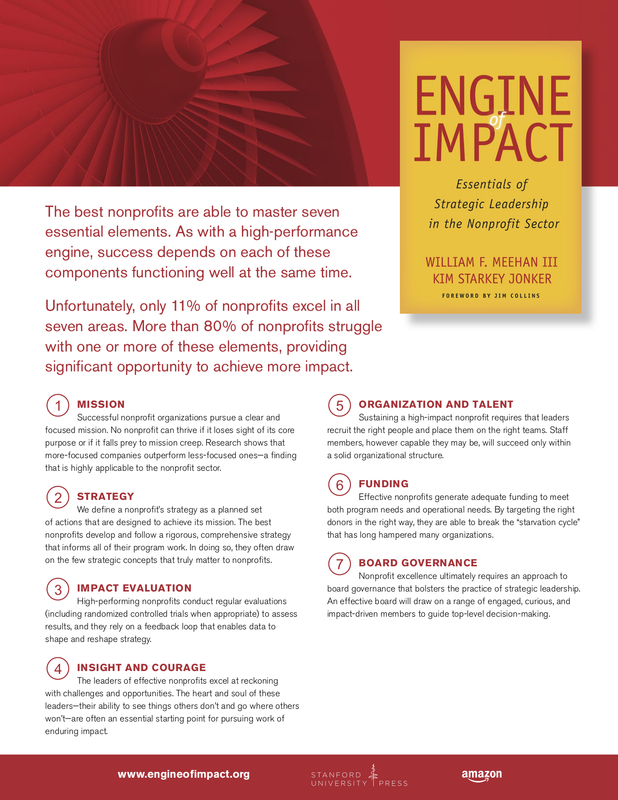 Our primary goal as authors is to lend insight and energy to the vital and essential discussion of what drives maximum impact from nonprofit organizations. While we are no Peter Drucker, we aspire to have our thinking contain at least some of the durability and impact that his thinking has had. As you will see, we believe that the nonprofit sector has a large and distinctive role to play if we are to reach our highest goals for society. 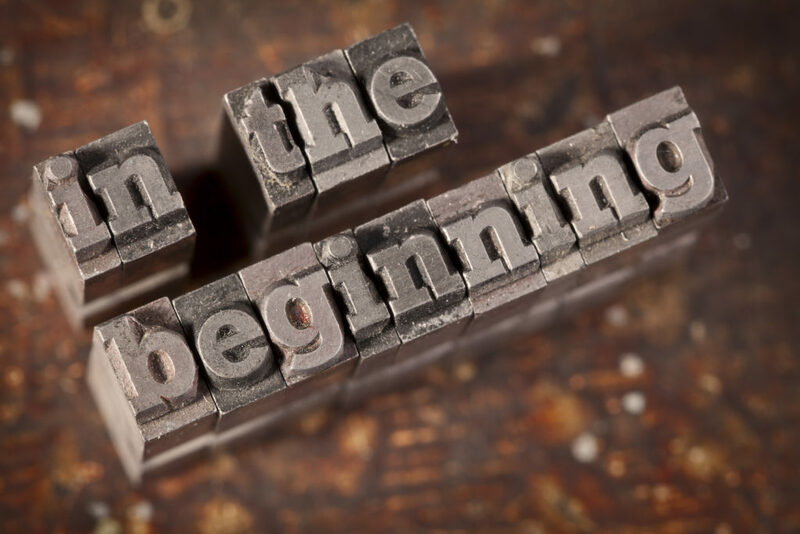 To make it happen, those in the sector need a common language, a new way of thinking, and a clear approach—not the Tower of Babel that exists today. Strategic leadership is the dynamic vehicle for meeting those needs. Turn the page and let us show you how. 1. Peter F. Drucker, Concept of the Corporation (New York: John Day Co., 1946); and Drucker, Managing the Nonprofit Organization: Principles and Practices (New York: HarperCollins, 1990). 2. Thomas J. Peters and Robert H. Waterman Jr., In Search of Excellence: Lessons from America’s Best-Run Companies (New York: Harper & Row, 1982). 3. Jim Collins, Good to Great: Why Some Companies Make the Leap . . . And Others Don’t (New York: Harper Business, 2001), 1–3. 4. Jim Collins, Good to Great and the Social Sectors: A Monograph to Accompany Good to Great (Why Business Thinking Is Not the Answer). (Boulder, CO: Jim Collins, 2005). 5. R. Michael Murray Jr. and Guillermo G. Marmol, “Leading from the Front,” McKinsey Quarterly 3 (Summer 1995): 18–31. 6. Richard N. Foster and Sarah Kaplan, Creative Destruction: Why Companies That Are Built to Last Underperform the Market—And How to Successfully Transform Them (New York: Currency/Doubleday, 2001). 7. Jeffrey Pfeffer and Robert I. Sutton, Hard Facts, Dangerous Half-Truths, and Total Nonsense: Profiting from Evidence-Based Management (Boston: Harvard Business School Press, 2006). 8. Leslie R. Crutchfield and Heather McLeod Grant, Forces for Good: The Six Practices of High-Impact Nonprofits (San Francisco: Jossey-Bass, 2008). 9. Mario Morino, Leap of Reason: Managing to Outcomes in an Era of Scarcity (Washington, DC: Venture Philanthropy Partners, 2011). 10. William F. Meehan III and Kim Starkey Jonker, 2016 Stanford Survey on Leadership and Management in the Nonprofit Sector, Stanford Graduate School of Business, 2016, engineofimpact.org/survey.